I'm a bit behind with these session reports. 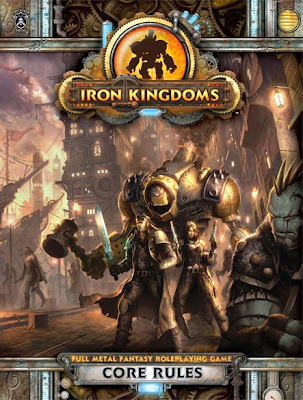 I'm knee deep in Warhammer FRP 1st Edition right now but this game is seriously looking like it might be my next game, mainly thanks to these reports. You can read the next session here. The UK Games Expo was, once again, a massive success this year. I attended it on the Sunday and had a great time, and with my wife Lisa and son Bruce in tow we hit the halls of the Hilton Metropole Hotel. 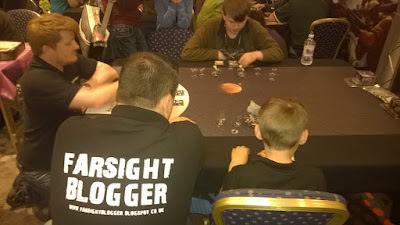 There were plenty of amazing stands there and I got myself some great bargains, but there was one stand I wanted to visit on behalf of Jedi News and that was the Fantasy Flight Games stand, and we found it in one of the major halls. We timed it just right; there were several demonstration games going on and plenty of people milling around, but we were lucky - the one game we really wanted to try was about to start and we dived in quick before anyone else could grab a seat. With a huge smile me and Bruce sat down to play Star Wars: Armada. This game of great hulking capital ships is something I’ve been looking forward to for a while. The models looked great - the Destroyer, the Corvette and the Nebulon-B ships, as well as the fighters, were great to look at and would make great models in anyone’s collection. At first I was looking for the similarities to FFG’s X-Wing Miniatures game, but I soon realised that the games were quite different. X-Wing relies on fast thinking and immediate turn-based responses, to reflect the quick fights between smaller ships, but these things required forward planning. We had the Imperial Destroyer and huge lumbering behemoths such as these do not turn on a shiny credit. We had to think a few turns ahead, decide on the strategy we would need to defeat these troublesome Rebels and hope that the decisions were the correct ones. There are a lot more rules to absorb in this game, moreso than X-Wing for sure. What may have taken twenty minutes to resolve in an X-Wing fight might take up to an hour with Star Wars: Armada. 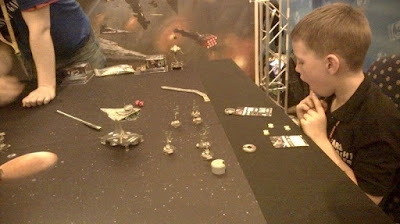 Once you commit to a maneuver there are several rounds of lumbering turbolaser violence, but the initial assumption that the turns may be a little boring is cancelled by the sheer amount of punishment these ships give out, and the split-second decisions you make for your fighter squadrons. The game never feels boring and there’s plenty to do as the most powerful warships in the galaxy slowly rumble across the table and chip away at each other. Still, this was just a few turns I played and I have yet to spend a lot of time choosing my orders and plotting my assault. Will the game have legs? Only long-term games and the expansions will tell. The few turns we got to play were good fun, but I feel that a proper blast at the game is in order. And when I say blast, what I mean is an entire afternoon/evening of getting to grips with the system and the dice, and putting these ship up against each a few times, just to iron out any rules kinks. 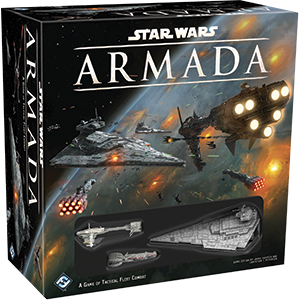 As with other FFG products, Star Wars: Armada is a collectible game so be on the lookout for plenty of ship expansions. The table is going to look absolutely epic with a few capital ships slowly moving into a better position to rain lasers on each other. It was a lot of fun, and I’m looking forward to getting my teeth into it proper. 'Geralt of Rivia is a witcher. A cunning sorcerer. A merciless assassin. I first became aware of Andrzej Sapkowski and Geralt the witcher through the video games, whioch no doubt many people did. I never played The Witcher, I wasn’t a huge fan of The Witcher 2 (though it was enjoyable), but The Witcher III blew me out of water; sumptuous visuals, amazing atmosphere, and a wonderfully rich open world to explore. The adventures of Geralt now had my undivided attention. So I looked further into the history of the character and the world and picked up a copy of The Last Wish, Andrzej Sapkowski’s first volume regarding the witcher and an introduction into the larger world he has created. It’s been a long time since a fantasy setting has really stuck in my mind - I had not yet come across any fantasy worlds that have excited me as much as Tolkien’s Middle-Earth, Howard’s Hyboria, Warhammer’s Old World or Fighting Fantasy’s Titan - but Sapkowski’s world is rich and alive, primarily through the actions and attitudes of the characters rather than any long-winded narrative on the author’s part. I suppose I had a lot of help from the computer games, too, what with the wonderful design work and the huge map to explore. The book far transcends that, though, and the stories are rich with detail and a sense of reality not often found in books such as these. So, briefly, Geralt is a witcher, taken as a child and put through some rather terrible training to become a sorcerous witcher, able to cast spells and fight against the monsters of the continent, to protect unsuspecting normal people from the terrors that lurk in the dark... for a price. Think of him as a monster bounty hunter, but he does have principals and a sense of honour and duty. His white hair, scarred face and cat-like eyes make him stand out and he and his skills are celebrated, untrusted and reviled, depending on where he is at the time. The book is more of a sequence of short stories, each adventure reflected upon as Geralt recovers from a nasty wound while fighting a striga, a monster thought created by an incestuous relationship between a king and his sibling. And that’s the first story; it doesn’t get any better - vampires, elves, angry Knights, cursed men, insidious Queens, and all and sundry come out of the woodwork to play in Geralts sandbox, but don’t be deceived; not all beauty is good, and not all ugliness is evil. The narrative doesn’t mess around and goes on a great pace, with enough detail to paint the world but no long-winded descriptions full of prose and sweeping paragraphs of world-building. Basically, enough to create the picture in your mind, with no huge walls of text that you skip past because you simply didn’t need to know about the small inconsequential details. It can sometimes be brutal, and the fight scenes are well detailed and can be quite exhilarating. I found the dialogue to be excellent and the conversations build the relationship between characters, carry the story and create the world in which they live, almost as if you’re listening to an audio recording of their conversations. The characters are solid and yet unpredictable, with the sully Geralt the most interesting by farm his boisterous friend Dandilion was incredibly annoying and frustrated me greatly - as I feel he was designed to do - and Yennefer was intriguing and designed in such a way that I’d love to learn more about her and what made her the way she is. All in all, great characters with depth and a lot of feeling. It’s a great book and one that I enjoyed immensely. I have only touched on the world of the witcher through a small amount of time on the game, but it‘s the books where I think I’ll find the true heart of the setting. I’m incredibly eager to read more. This book was certainly something I found hard to put down. A world of danger, intrigue and more than few surprises - a must read for any fantasy fan. Sparth (or Nicolas Bouvier, to give him his actual name) is a phenomenal artist and one of the stars of the concept art genre, should such a thing exist. I find myself in complete agreement with the foreword by Thom Tenery, another exceptional artist, when he describes Sparth's work as 'utterly luminous, rich in abstraction, and graphically built'. For years now Sparth has been at the forefront of conceptual art and has been putting that talent to good use at 343 Industries since 2009. As such it should come as no surprise that the work on display in this third book (following in the footsteps of Structura 1 and 2) is of a quality not often seen, excepting of course from the people who try to imitate Sparth's style. Which, given the impact he has had on the concept art industry, is quite a few people. Sparth's work is a riot of colour and form but not, in most cases, detail. He is a master of showing you the bare bones of something, the bright outline, with just enough shape so that you know what you're looking at, and letting your own mind fill in the story. This might not appeal to some but it is a very important skill in the world of concept art. You don't want an artist that gives you a finished picture and says 'it looks like this', rather you need someone who shows you a flavour of something so that creative minds can mine the image for every hint of context, nuance and meaning which they can then build upon. It is only later, when definite directions have been chosen, that an artist will go away and produce detailed work. That's not to say that there is no detail at all in the work shown in Structura 3. Due to Sparth's involvement with 343 Industries there is a whole chapter dedicated to his Halo work and the book cover illustrations are also very nicely finished pieces. It's merely that the majority of work in this book falls into the former category. In fact there is a whole chapter dedicated to what are known as 'speed paints' (a term Sparth mentions in the introduction that he doesn't like) which constitutes a series of pieces where the artist only allows themselves 30 minutes to complete a piece, start to finish. As Sparth explains; "when you work within a 30-minutes time frame, you have to lock the composition in your mind first before it reaches the canvas. What prevails is your ability to put a very simple, abstract idea into concrete shapes". The result are very interesting works of art that almost beg the viewer to give them a story. The last section of the book includes some tutorials for those that like to practice digital artistry but, speaking as someone who couldn't draw the outline of a tadpole if his life depended upon it, I wouldn't have described these as beginner pieces and I was left feeling that some working knowledge of the tools of the trade was a bare minimum requirement. So all in all this is an excellent book. I do have a couple of complaints but nothing that would stop me from recommending it. The first is that, as mentioned earlier, most of the artwork lacks clear detail and there are three pieces that even seem childish. I prefer art that has clear definition and the only reason that I like Sparth's work so much is due to the subject matter. Sparth is a master of science fiction and seems to grasp like no other the sheer scale that science fiction cries out for. Big ships, grand vistas, towering structures, all the best ingredients of grand space opera can be found in his work. I only wish he would drawn some as fine art, not just concepts. The other complaint falls squarely into the lap of the publisher, I think, as this book has been printed in a different format to the other two. This is a personal bugbear of mine. When I get a collection together I would prefer it if the books could all, at the very least, be printed in the same fashion. Structura 1 & 2 were printed in a sort of landscape format whereas book three has been printed as portrait. Maybe it was to show off the art to it's fullest potential and artistic merits won out over printing practicalities. All I know is that the books can't all sit on the same shelf (a long story that revolves around the number of books I have requiring shelves crammed in wherever I can fit them). I'm peeved about it, but not irate. I feel I'm being fair about it. So if you like grand sci-fi in a colourful, rich style from one of the masters of modern concept art then this book is for you. If not then see if you can find a copy somewhere and give it a go. Sparth's the artist, if any, that's going to change your mind. 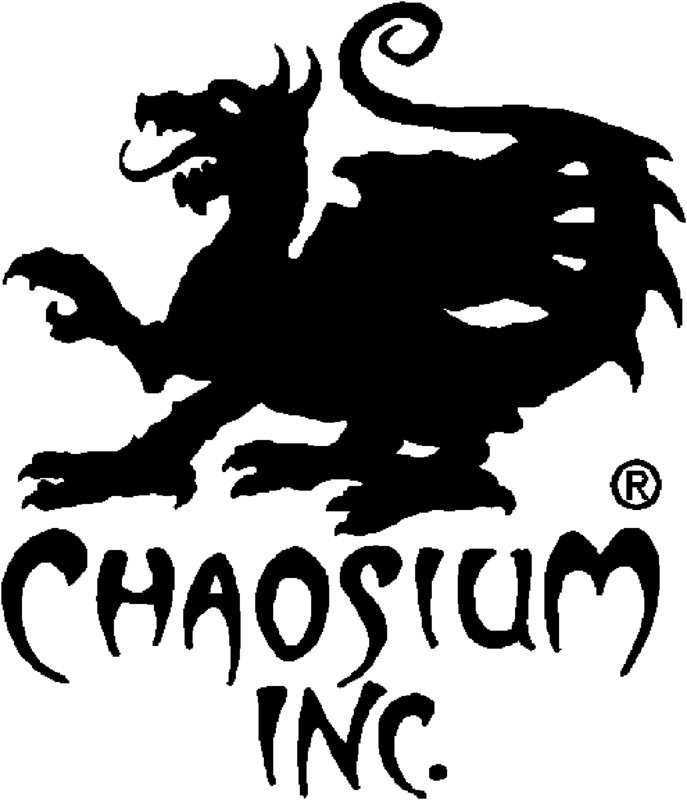 News - GREG STAFFORD & SANDY PETERSEN RETURN TO CHAOSIUM INC.
'While we wanted the Kickstarter backers to hear this directly from us first, we also wanted all of you, the faithful, to get this information as soon as possible. Here is what we sent out. More very soon. Copyright © 2015 Chaosium Inc., All rights reserved. This is a sourcebook that fans of the Star Wars underworld, like myself, have been eagerly awaiting. ‘Escape the oppressive rule of the Empire and engage in devious schemes with the galaxy’s slimiest and most notorious gangsters: the Hutts! 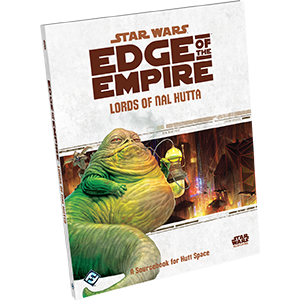 No matter your vice – gambling, luxury, spice, beauty, or other – Whatever your pleasure, you can find it in abundance in Hutt Space, and you can find it in Lords of Nal Hutta, the Hutt Space sourcebook for the Star Wars®: Edge of the Empire™ Roleplaying Game. Smugglers, freelancers and mercenaries flock to the galaxy’s many Hutt-controlled hives of scum and villainy to fulfill their depraved desires or make a quick profit. Opportunity is abundant, but it comes at a perilously steep price. Anyone who flies Hutt Space lanes and hauls their questionable cargo must continuously ask themselves how far they’re willing to go in the name of cold, hard credits. The danger and intrigue that the underworld presents is attractive, full of possibilities and a lot of fun for players such as myself. I’ve been gaming in the dark corners of the Star Wars galaxy for nearly thirty years so to have the chance to see how the Hutts, Nar Shadaa and the criminal heart of the universe operate. It’s a big book, in at 144 pages and wondefully presented with that Fantasy Flight Games quality, something we’ve come to expect from their products. The artwork is gorgeous and that’s something that has been consistent throughout all of these books - the imagery really captures the feel of the era of the original trilogy, and it really helps to get into the mood, so to speak, when you’re setting up a game. So what does Lords of Nal Hutta offer us? Plenty. You want to know about the history of the Hutts? You got it. You need info on Hutt space? Here you go. Want some new aliens, gear and ships to play with? Help yourself. Want some adventures to challenge your players? Knock yourself out. Lords of Nal Hutta contains everything a GM needs to take their group on a wild ride through this dangerous, dark place. There are some new options to play new species; Ganks, Niktos, Sakiyans and you can even play a Hutt - yeah, you read that right. Can you picture a Hutt with a blaster slung across it’s great torso? I never could. Now I can’t imagine the Star Wars universe without it, and I’m literally begging one of my players to create a Hutt character - the roleplaying opportunity, chances for character intrigue and the sheer melodrama that a Hutt PC could bring to the table is screaming out for a campaign. Along with the rest of the great material in this book - twelve planets to travel to and adventure on, for Vader’s sake! - I think my gaming group is going to get a hell of a lot of use out of this, and that makes the book worth every penny spent on it. A great product from the guys at Fantasy Flight Games, and an important addition to the Star Wars RPG product line.